It’s a common trope in many films, TV shows, and books, ranging from Star Wars to Kung Fu Panda. A young protagonist eagerly goes to a sage to learn of the truth, only to find things are not as they appear, and to become frustrated by the teacher’s refusal to say anything directly, instead preferring paradoxes, aphorisms and vagaries rather like “Confucius says” sayings in fortune cookies. 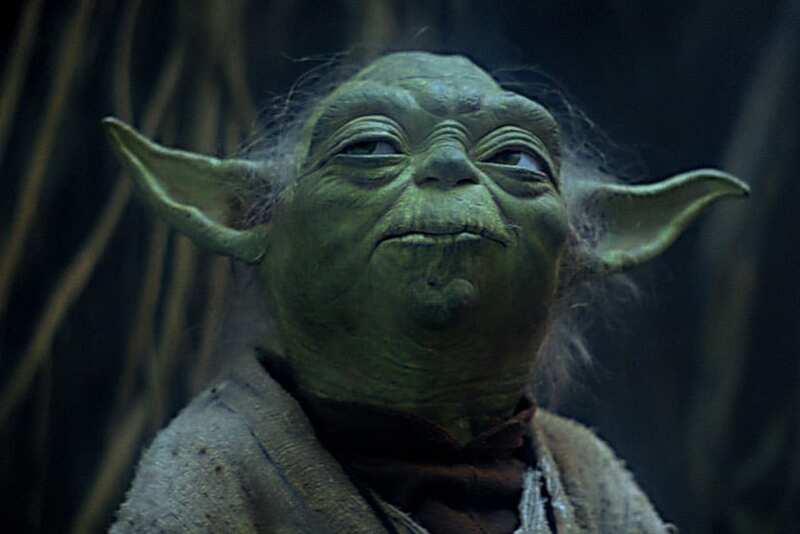 There are few more iconic examples of this than Yoda, particularly as portrayed in the 1980 film The Empire Strikes Back, who is notorious for speaking in riddles, and for inverting his sentences after the fashion of ancient Latin or Greek. In tonight’s Gospel, Jesus seems to be typical of this oft-trod trope for the dubiously wise man (Jn 8:21-30). Following Yoda we might say, “Cryptic, He is”. Instead of answering the Jews’ questions immediately and directly, Jesus changes the topic, or uses indirect speech, or plays with imagery and metaphor. Little wonder the Pharisees fail to understand Him, we might say: like Yoda, he’s being deliberately confusing. And yet, there is more both to Star Wars and to tonight’s Gospel. Yoda and his back-to-front phrasing are still a huge hit among Star Wars fans. When Yoda pretends to be a crazy old man, he’s doing so for a reason. He wants to test Luke, to measure his character and his resolve, and to teach him to look beyond the immediately apparent to what lies within. In particular, he wants to challenge Luke’s preconceptions about his vocation, what he thinks a Jedi Master should be. This is why, when Luke tells him he’s looking for a Jedi Master to be a great warrior, Yoda responds by telling him that “Wars do not make one great”. So too, Our Lord’s goal tonight is not to get under the Pharisees’ skin; rather, like so often, he’s trying to stretch them and us to look beyond our preconceptions about what a Christian Master should look like, and to receive with open ears and heart the wisdom standing right in front of them. When Jesus says He is going away and that they can’t go where He is going, He is of course predicting both His own death and His Ascension: but the Pharisees read this as suicidal ideation or complete gobbledygook. So too, when Jesus tells the Pharisees, “I am He”, He is of course using biblical language reserved only for God (cf. Deut 32:39; Is 43:10-11), as when God tells Moses from the burning bush, “I am who I am” (Ex 3:14). This is God’s way of saying that He is the Supreme Being, Being itself, upon which all other beings depend for their existence. And if He is the source of existence, He is the source of every other perfection also. So when Jesus says, “You will die in your sins unless you believe that I-am-He”, He is not being deliberately unintelligible: He is, rather, making a bold and clear claim: that He is sent by the Father, and speaks for the Father; He is the Anointed One of God, God Himself. His audience were of course the Pharisees: scholars of the Bible, the Jewish law and customs, and the mysteries of God. They should have known immediately what a bold claim Jesus was making. But they thought they knew Him, had him all summed up, that He was just the carpenter’s boy with ideas too big for the station. So Jesus says, “Let me repeat again what I’ve said from the start” and he explains his connection to the one who is not just Being itself but Truth itself. Learned ladies such as yourselves will appreciate that there is an ambiguity in the original Greek: the phrase translated in our lectionary as “what I’ve told you from the outset” – Τὴν ἀρχὴν ὅ τι καὶ λαλῶ ὑμῖν – could also be translated “what I’ve said since the beginning of time”. In other words, Jesus himself is the beginning, the Word spoken by the Father from all eternity and now spoken in time to us. Yet again Our Lord is giving the Pharisees a chance to connect what they already know from the Scriptures with what is in front of them; and yet again, they will not see. So He tries a third time to tell them who He is: “When I am lifted up you will know that I-am-He”. This time He is of course predicting His own Crucifixion, His ‘hour of glory’ when the Father will demonstrate that He has not abandoned His beloved Son. At that point, John tells us, some came to believe in Him, but as Lent progresses it becomes clear that others will resist knowing him to the end. The Pharisees, like not a few university lecturers and students, have a great deal of knowledge but not necessarily wisdom. As someone once said, knowledge is knowing that tomato is a fruit, but wisdom is not putting it in a fruit salad! Though they can quote any part of the Scriptures at will, Jesus is showing them that they are so narrow-minded that they cannot see the facts before them and what God has revealed to them. They keep putting the tomato in the fruit salad. This is why Jesus reveals to them: I was with God from the beginning and come from Him, I have come that I might witness to his truth and be lifted up on the cross, I am returning to the Father and ascending to heaven. Not because He likes to brag about Himself, but to try to jolt them into seeing things differently, seeing things more deeply, seeing what is actually right before them. The irony is that they lack wisdom, but Christ who is the eternal Wisdom of God, Sancta Sophia, stands ready to share his wisdom with them, if only they will open their eyes and minds and hearts. This is the edited text of the homily given by Archbishop Anthony Fisher OP for the Fifth Sunday of Lent at Sancta Sophia College, Camperdown, on 4 April 2017. Next articleSimcha Fisher: What do guardian angels do?